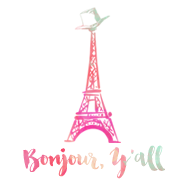 Bonjour, Y'all: Have a WARM Weekend! We had a busy week, so Logan and I are looking forward to a night of sweatpants, our heater, hot chocolate, and some NCIS! (The Friday night English show over here.) Tomorrow morning, the LADIES of the Colorado are having a baking party! Its a Colorado girls tradition- I am going to be making gingerbread cupcakes (will post the recipe! ), lemon bars, and homemade oatmeal chocolate chip cookies. YUM. Want the gingerbread cupcake recipe!! Or better yet, will taste it in person. Yum! Mom- see you in a week!